How important is the Internet? We learned the answer in the old farmhouse at the top of the hill in Benzonia, where the Michigan Land Use Institute was founded. 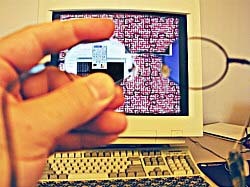 There were eight of us with the organization then, doing our research and writing at old desks topped by new computers and monitors, all woven together on an internal server that also provided access to the Internet. It was 1998 and we thought we were pretty hip. After all, for a small non-profit we’d done well. Six months before, the Institute launched the first version of its Web site. One sweaty July afternoon, though, the site went down, and with it our internal server and email. I”ll never forget the next thing that happened. One by one closed office doors opened. Young staffers, eyebrows raised, joined the middle age people in the building’s central hall. No question. Work came to a standstill and wouldn’t resume until service was restored. We looked at each other, shrugged, and creeped back to our desks to see if we were back online. We weren’t, so we took the afternoon off and rolled down the hill to the beach at Crystal Lake. Today I had a conversation with an old friend who edits in New York . She asked me what I thought the attack meant, and where “it all,” i.e. the Internet, was going. I’m no soothsayer, but let’s consider a few views about the Internet that are unassailable at this point. For one, if television went down for a week, does it really make much of a difference in the course of our lives over those seven days? Perhaps for advertisers, jocks, actors, newscasters, and the few million of us who can’t live without the tube. Hardly a moment to panic. Same for radio or newspapers. If they disappeared for a week, what would it really matter? But if the Internet went down for a week, there would be a global economic crisis. Companies would collapse. Entire economic sectors would retreat. Business and industry would come to a standstill at the precise moment that the servers failed. The Internet is so tightly meshed into human commerce that it is impossible to exist without it. What’s more, the evolution of the Internet as the dominant invention of its age started in 1994, just 13 years ago, when AOL provided the first dial-up service. I like to compare these first years of the Internet to the early decades of the auto industry. At one time, around 1917, 23 automobile companies in Detroit, many of them located along Woodward Avenue, assembled more than 1 million vehicles a year. Building cars in Detroit changed the world. It prompted new wealth, union organizing, and land and resource-hungry development patterns. Cars also produced a culture of ease, convenience, and physical lassitude based on cheap oil, cheap land, and massive spending on roads and highways. The auto age is ending. The Internet is close to surpassing the auto economy and culture, if it hasn’t already done so. The digital backbone of the Web supports a global economic, cultural, communications, trade, entertainment, and governing infrastructure that has never been more interconnected, and can’t be replaced. Bill Bobier, who’s a progressive Republican from Oceana County on Michigan’s west side, once represented four Lake Michigan counties in the state Legislature. At the time, in the mid-1990s, he was one of the rare good guys in a Legislature swinging so hard right that even Michigan Republicans didn’t recognize their own kind. What made Bobier especially distinctive was his farm, where he and his wife raised vegetables and beef. I once spent the day out there watching Bill fix his fences. We then sat for a few hours in his farm country kitchen talking about the agriculture economy. I remember him explain that every time the Michigan Department of Agriculture and the Department of Environmental Quality issued a new regulation to manage big growers, the first folks hurt were the small guys. Bill brought the same message to the Seeds of Prosperity conference today. Oceana County has emerged as one of the centers of agricultural innovation in the Midwest. Apple growers over there, for instance, developed the quick fresh-freeze and packaging process that became McDonald’s popular Apple Dippers. The county’s asparagus growers figured out how to market their fresh frozen products to Wal-Mart and other food retailers. Since leaving the Legislature, Bill spends most of his professional time in Lansing, where he has an office across the street from the Capitol, and lobbies on farmland conservation and agriculture. The small farm, one of Michigan’s important employers, is as critical to the state’s economy as any small manufacturer, he argues. Maybe more so at this point as Michigan sheds manufacturing jobs by the tens of thousands a year. Still, the Department of Labor and Economic Growth, the business recruitment agency, keeps falling over itself to recruit small manufacturers. DLEG does very little to promote agriculture or small growers. It’s another example of 20th century thinking that needs updating. In fact, there are few small manufacturers moving to Michigan or getting started here. There are many more small farmers, though, getting into business, especially in the Consumer Supported Agriculture sector which has grown up around the state’s big cities. Everybody eats, Bobier argues. 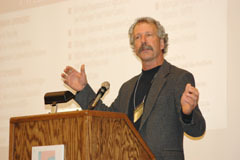 There ought to be a way for the state to leverage the abundance of fresh food produced by small growers to build the regional processing, marketing, and distribution systems that make it possible for residents to eat fresh food, for farmers to gain prices worthy of their labor and skill, and for a much larger farm sector to employ thousands of people who earn living wages. We did it with widgets, said Bobier, and we ought do it with home-grown products that people really need. Fresh fruits, vegetables, dairy products, and meat. Every now and again you cross paths with someone who just vibrates differently than the ordinary Joe. It’s more than superior intelligence, or charisma, wisdom, energy, and experience. It’s how rare people draw those gifts together in a way that is so graceful and encompassing and fearless. A statesman, if you will. Michigan is in desperate need of more of these kind of people. Michigan’s farm sector, fortunately, is graced by an authentic leader, a Nigerian-born agriculture economist named Soji Adelaja, who leads the Land Policy Institute at Michigan State University. 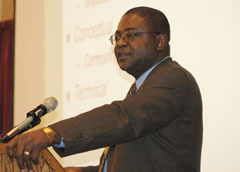 Early in his career Soji spent time on Wall Street, where he applied the very same economic models used for attaining crop production efficiency to investment forecasting. He made his name at Rutgers, where he was a senior executive in the agricultural extension program, and among other things, developed New Jersey’s $1 billion farmland and open space investment fund. MSU convinced Soji to move himself and his family to Michigan nearly four years ago, when the governor and Legislature seemed poised to enact pieces of a new smart growth development strategy that included conserving farmland and open space, strengthening cities, and slowing down energy- and money-wasting sprawl. Though Soji’s a nationally renown economist, at heart he’s really an accomplished public policy advocate who was convinced that Michigan was poised on the threshold of a new economic era based on better uses of land. Not long after Soji arrived, unfortunately, the bottom dropped out of Michigan’s economy and instead of talking about how to rein in sprawl and smart growth the state conversation shifted to how to prevent decline. Like other advocates Soji retooled the message and suggested that Michigan’s competitiveness could be tied to how we treated cities and land, how we thought about food and farming, how reliance on a multitude of interlocking ideas instead of just one idea — auto manufacturing — could make the state’s transition much easier. Soji, in short, began to talk about prosperity. He was among the first to frame that big idea around leveraging Michigan’s agriculture sector in new ways. He spoke here today in his lovely Nigerian accent to some 300 food and farming specialists and advocates, arguing that good food grown and consumed in Michigan is as important to the 21st century as auto manufacturing was in the 20th. There was a time not terribly long ago when such a notion would have been considered so far from the mainstream as to be almost laughable. Not any more. In food, land, and good health lies the foundation of a durable economy that Michigan is desperate to develop. 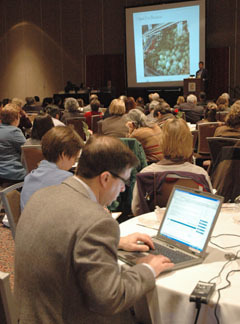 In Lansing today to cover the events and presentations during the day long Seeds of Prosperity Conference. Among all of the states, there is arguably none experiencing a greater economic struggle than Michigan. Measured in standard indicators of economic performance — joblessness, number of young adults departing the state, home foreclosures, and rates of childhood poverty — Michigan ranks at the top or near the top. Personal income has fallen 5 percent below the national average, the first time that’s occurred since the Depression. And in the measures that Michigan once led the nation — income growth, new business starts, average wage increases — the state is heading towards Mississippi instead of California. One of the unexpectedly strong economic sectors in Michigan, though, is agriculture. Really. Michigan’s more than 55,000 farms produced more than 200 commodities that generated $4.5 billion in revenue at the farm gate last year. The Michigan Department of Agriculture estimates that agriculture’s overall contribution to Michigan’s economy—through products, processing, marketing, distribution, and other activities—is $60 billion annually and accounts for one million jobs. But Michigan doesn’t pay nearly enough attention to its food and farming industry. Our second-term governor, Democrat Jennifer M. Granholm, promoted a Select Michigan program early in her first term. That produced heightened sales of Michigan-grown fresh fruit and vegetables. Lately, she’s talked a lot about alternative energy, especially ethanol production, which could produce a boon for corn and grain producers. It could conserve farmland, a good, but also add to erosion and other environmental harms, a bad. Most importantly, the loopy thermodynamics of ethanol production are enough to make any thinking person scratch their head. A gallon of ethanol produces just about the same amount of energy as it takes to grow, ship, and process the corn needed to yield a gallon which produces the same amount of energy…. Instead, Michigan needs to look much harder at the places in the farm and food community where there is real excitement. And those sectors have converged around Entrepreneurial Agriculture, which is the great name for a movement developed by my colleague Patty Cantrell to describe the growers, marketers, shippers, manufacturers, processors, and markets that make it easier for good food grown in Michigan to actually reach its residents. Goodness knows, this state knows how to eat. Look around and that’s more than apparent. Michigan has the highest rate of obesity in the nation, and among the highest rates of heart disease and diabetes. Yet next to California, we also have the second highest number of home grown commodities in the country. It’s a magnificent feast produced on good Michigan ground by hardworking Michigan residents. 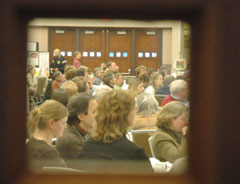 The point of this conference is to elevate to public attention the people and projects that are putting more of that good healthy food on Michigan’s table. Those of you who read Wendell Berry, the great Kentucky poet, novelist, and essayist, know that when stripped to its essence, Berry’s singular contribution to the national idea is this: America works best when its people are connected to their places. Successful communities and a durable nation, Berry argues, depend on people who love and safeguard the land. The other side of this Jeffersonian thought, one that Berry writes about with eloquence and depth, is that rootlessness has undermined America’s social and economic edifice. What’s intriguing as I travel the country is the resurgence of allegiance that Americans express for their place. I’m not pollyannish about this. Crime, family discord, joblessness, political division, and the sense of unease that ex ists in the country provide plenty of evidence that we are not yet close to solving our many ills. Still, there is an unmistakable surge of fealty that many Americans exhibit for where they live. Expressions of community loyalty are easy to find, and never more so than last week during the run up to the Super Bowl. Steve Rubel’s fine Micro Persuasion, which covers social media trends, drew my attention to this picture of Chicago from Flickr. Here is an example of how a blog and social media Web site focus on a civic message expressed beautifully across one of the world’s distinctive skylines. Chicago, by the way, has come way back from the delapidated condition that existed in the 1970s and 1980s. The city embraced a three-point economic development strategy that stresses environmental sensitivity, energy efficiency, natural resource conservation, and park investment, and you’ll be reading much more about that here. More evidence of the convergence of social media and place is the development of “place blogging,” a great example of which is A VC, based in New York. Place bloggers are taking up the space left vacant by the often vapid and blood-focused urban and regional broadcast newsrooms, who try to describe their places in 3-minute takes. Depth and knowledge, as local TV news watchers know, are not virtues in local television news. Print newsies also ought to be aware, too. Place bloggers are challenging conventional dailies and weeklies in covering trends, economic developments, housing, and cultural events. Like other forms of media produced by consumers, place bloggers are defining the new intellectual geography of reader and viewer interest, and in some cases are breaking news and starting to make a living at it. The point is that an old American value is developing new momentum, a trend reflected in the generation of fresh voices in social media.